As part of the Clean Power Plan (CPP), the U.S. Environmental Protection Agency (EPA) requires Missouri to reduce its power sector emissions by 29 percent below 2012 levels by 2030. New WRI analysis shows the state can achieve 90 percent of the required reductions by following through on its existing clean energy policies and making more efficient use of existing power plants. Plus, expanding the state’s renewable energy standard beyond 2021 can more than make up the remaining gap, reducing Missouri’s power sector emissions 34 percent below 2012 by 2030. 1. Following through on its existing clean energy policies. Missouri’s renewable energy standard requires 15 percent of investor-owned utility sales to come from renewables by 2021. The state also has voluntary policies to encourage utilities to offer cost-effective energy efficiency programs to their customers—the Public Service Commission set electricity savings goals that reach 1.9 percent of electricity sales per year in 2020 and beyond. 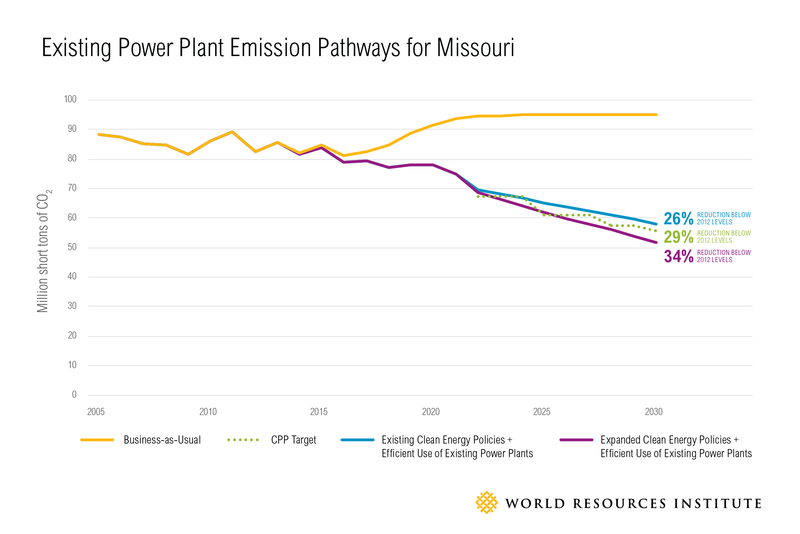 These policies play a critical role in Missouri’s CPP compliance, as they could achieve 63 percent of the emissions reductions required to meet the CPP target. If utilities don’t scale up their use of efficiency and renewables, they will likely fall short of the CPP target and may need to purchase credits from other states. 2. Making more efficient use of existing natural gas and coal plants. Combined cycle natural gas plants in Missouri generated less than one-fourth of the electricity they were capable of producing in 2012. By running existing natural gas plants at 75 percent of their full capacity and making low- and no-cost operational improvements at existing coal plants in addition to the policies above, Missouri could achieve 90 percent of the emissions reductions required to meet the CPP target. 3. Ramping up renewable generation after the current renewable energy standard is reached in 2021. Taking the first two steps can achieve most of Missouri’s required reductions, and increasing renewable generation after 2021 can make up the gap that remains. If Missouri increased renewable generation to 20 percent of all state electricity sales by 2030, it would more than make up the shortfall, exceeding the required reductions by 17 percent. As of 2014, Missouri’s wind industry provided $1.4 million in annual land lease payments and nearly $1 billion in total capital investment in the state. Scaling up Missouri’s efficiency programs could save homes and businesses more than $6 billion in energy bills over the lifetime of implemented efficiency measures. Missouri could take in $20 million every year from 2022-2030 by taking the three steps above and selling surplus carbon credits to other states (assuming a $10 per ton price of interstate emission allowances). The CPP encourages states to trade credits even if they don’t formally join a trading program. Missouri can put itself in a strong position to comply with the CPP by building on the policies it already has in place and taking greater advantage of economic opportunities in clean energy. By continuing to develop renewable resources and increase its efficiency programs, Missouri can save money for homes and businesses, scale up in-state investment, and create new jobs while meeting its CPP targets. Failing to follow through on these policies could make CPP compliance more difficult and expensive.